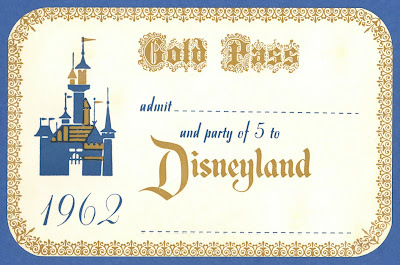 Vintage Disneyland Tickets: 1962 Disneyland Gold Pass - 1000th Post! Can you believe this is my 1,000th post here on Vintage Disneyland Tickets? I sure can’t, but that's what the little counter thing says. Seems like it was just yesterday that I did my first post (link - my cropping was really bad) OK it feels like three years ago! How will we Celebrate the 1,000th post? 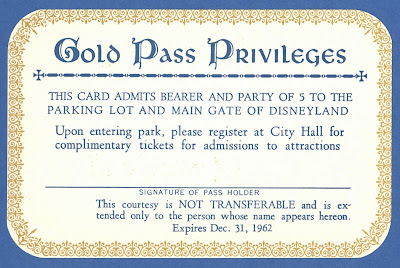 How about a GOLD PASS to Disneyland? How did you get one of these in 1962? Did you have to know Walt? Up to six people thru the main gate any day the park is open - wow! The Gold Pass even gets better. Once inside the park head over to City Hall and get complimentary attraction tickets for everyone, every day the park is open! This is 1962's version of a premium annual pass for up to 6 people. 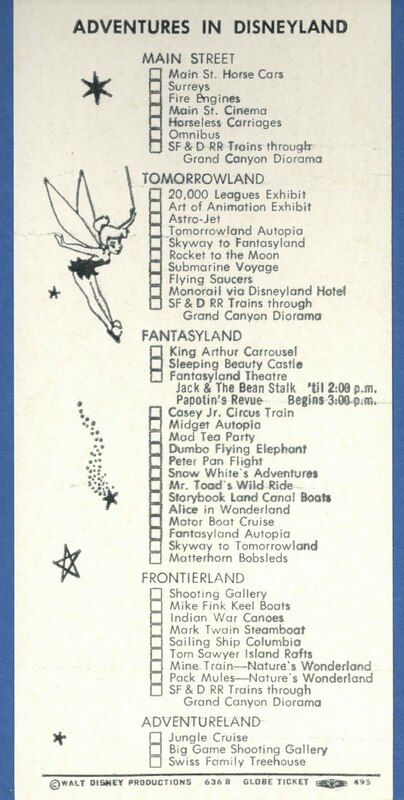 Here’s a Courtesy Guest book from June 1963, I’m guessing these are the type they gave out for Gold Pass holders, but I’m not certain. 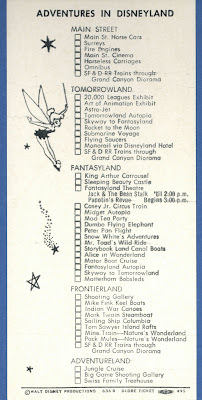 This Magic Key ticket is from back in the days when the “E” attractions were still ¢50. The three stars on the right side as well as the “X” in the serial number indicate this is a courtesy or complimentary ticket. Amazing castle and Disneyland font, I never get tired of looking at these. Sharp eyes will notice the rare (one summer only) appearance of Papotin’s Revue at the Fantasyland Theater. Google “Papotin’s Revue” - I made the top of the list! More than once I’ve googled a vintage Disneyland ticket item or subject and found my blog at or near the top of the list, I’m generally modest, but I gotta admit I’m proud of that. Thank you everyone for visiting and commenting on my blog – it really is a pleasure to do these posts. I’ve met some great people thru this blog, and of course, my utmost respect goes out to the “Big Three” (click to see their 1000th posts) – Daveland, Gorilla’s Don’t Blog and Stuff from the Park! Congrats on the 1000th post! Your blog is very much appreciated indeed. Congrats Tim! Love that Gold Pass...almost as good as a Golden Ticket! Congrats Tim on the 1000th post. Now you need the folder for the pass. Thanks for all of your wonderful work and dedication! Quite the milestone Tim, congratulations! You set a pretty high bar for us all. EXCELLENT! Congratulations on your hard work! 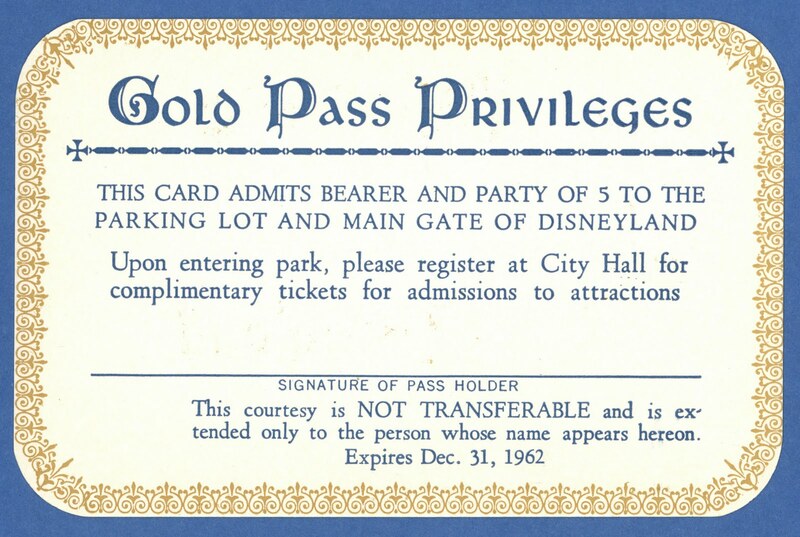 Yes a Golden Pass looks awesome...I'll bet it was something given to castmembers to give to family, maybe? Tim, I see your stuff all the time whenever I Google something Disneyland related! 1000 posts is no small feat, for sure; MANY congratulations on your excellent blog, and thanks for all of the neat tickets and other stuff that you share. That Gold Pass is pretty sweet; imagine being able to go to the park as often as you wanted in 1962 - with a good camera and lots of Kodachrome slide film! Congratulations! I'm sure you're just getting started! Congratulations, Tim! 1000 posts! Wow! Love the site- and much respect for the man behind it. Congratulations on number 1000! I'm only just beginning to see what it must take to accomplish such a feat. Great blog and great post. The Gold Pass! How cool is that?! Tim, you continue to amaze me with what you find! Comgrats on the 100th! Hope I can hit that golden mark, too! Congratulations on the milestone, VDT. I really enjoy your blog, it's my bag, man.